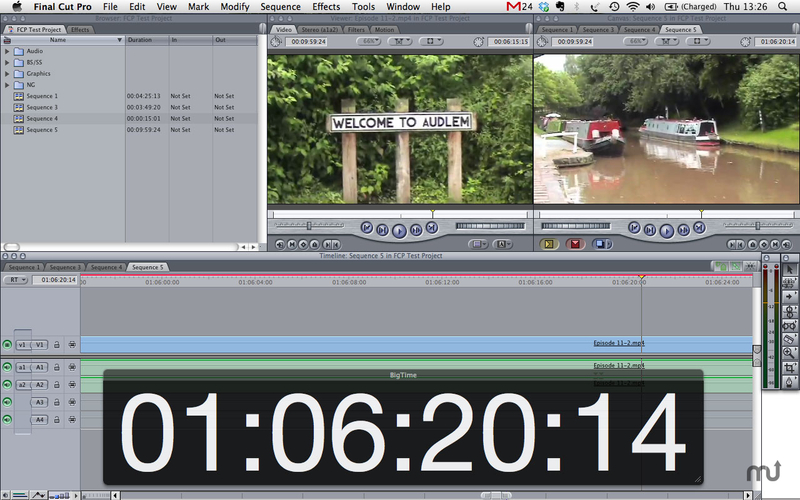 A sleek floating timecode display for Final Cut Pro. Is there a better alternative to BigTime? Is BigTime really the best app in Video category? Will BigTime work good on macOS 10.13.4? BigTime is a floating timecode display for Final Cut Pro 5-7. An indispensible tool for client viewings (and ex-Avid editors), BigTime shows the sequence or source clip timecode on a resizable window. No more squinting required! BigTime can be freely resized and moved anywhere on screen. The text and background colours can be customised to suit your personal taste and the frames display can be shown or hidden as required. [FIX] Fixed issue with BigTime Helper app not being installed if BigTime has not been previously installed. BigTime needs a rating. Be the first to rate this app and get the discussion started!